New York — Farmworkers and their allies completed a five-day “Freedom Fast” organized by the Coalition of Immokalee Workers, on March 15 at the United Nations’ Dag Hammarskjold Plaza. This followed a march of hundreds of protesters in a five-block-long “Time’s Up Wendy’s March.” The demonstration began at the U.N. building and passed by the New York offices of Wendy’s board chairperson and largest shareholder Nelson Peltz. Demonstrators chanted “Boycott Wendy’s!” and “Down, down exploitation! Up, up fair food nation!” Supporters came from as far away as Tennessee, Texas and California to show solidarity with the farmworkers. For five days, the hunger strikers and their supporters camped and rallied outside billionaire Peltz’s Park Avenue hedge fund offices of Trian Partners. 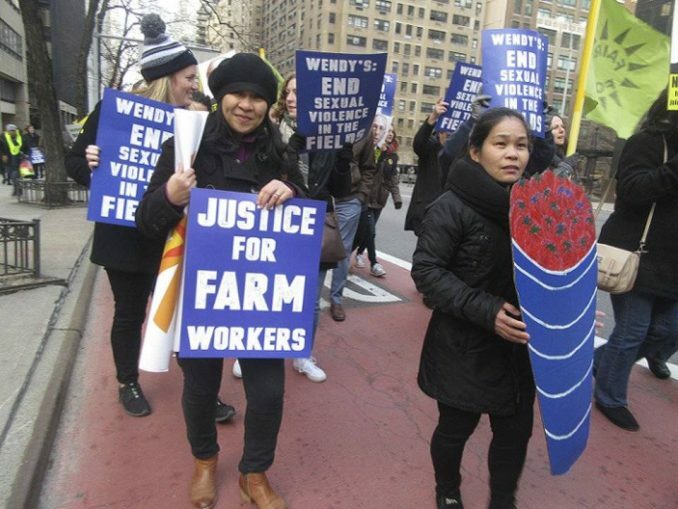 A prominent colorful banner read, “We fast because Nelson Peltz won’t use his power to end sexual violence against farmworker women.” Some 103,000 petition signatures were gathered supporting the fast and Wendy’s boycott. Although Peltz’s office accepted only a fraction of the petitions, fasters celebrated, saying this showed the farmworkers’ strength and the company’s weakness. Those fasting and their allies demanded that Wendy’s join the Fair Food Program, set up by the CIW in 2011 in Florida. This established groundbreaking worker protections, including more humane working conditions and fairer wages. Significantly, it includes a no-tolerance policy on sexual harassment and abuse faced by tens of thousands of women immigrants in the tomato fields. Unlike McDonald’s, Burger King and other fast food giants, Wendy’s owners and top officials refuse to join the program. Protesters denounced ongoing wage theft, child labor and other human rights abuses and sexual violence faced by workers in Mexico’s produce industry. Wendy’s currently buys its tomatoes there to avoid having to join the Fair Food Program, recognize workers’ rights and stop abuse of women in the fields. The Coalition of Immokalee Workers website provides background on this important struggle and its Fair Food Program, as well as daily coverage of the Freedom Fast. Kathy Durkin contributed to this article.